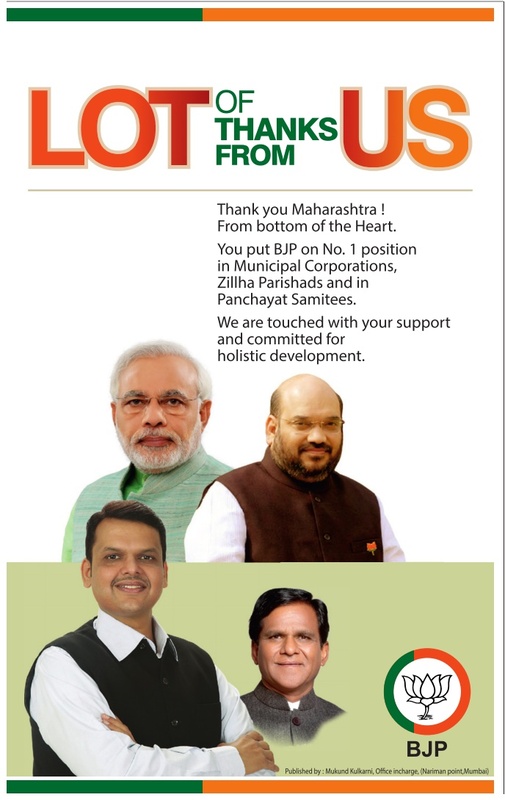 The Bharatiya Janata Party won eight out of 10 municipal corporations across Maharashtra and almost ended rival Shiv Sena's stronghold over capital Mumbai as chief minister Devendra Fadnavis' strategy of going it alone in the civic elections paid off handsomely . 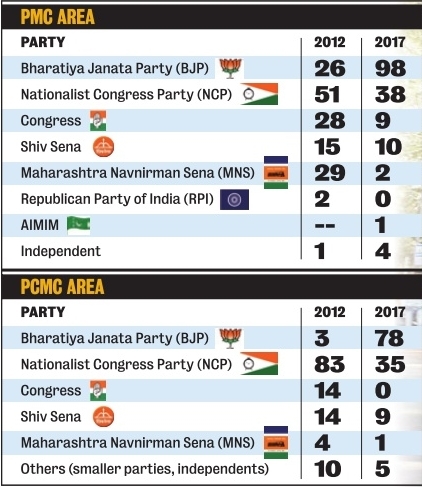 A wave of support for the BJP and Fadnavis across urban Maharashtra sunk the Congress and the NCP, with the BJP emerging victorious on its own in many civic bodies for the first time in many years. 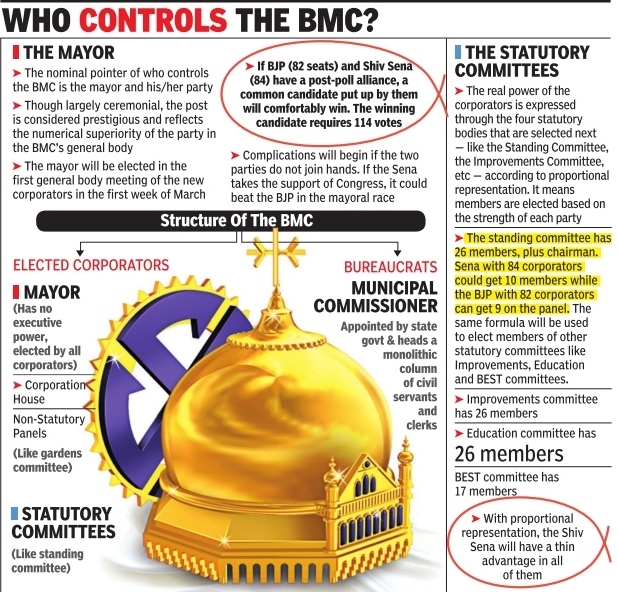 The Sena's hold over Asia's richest civic body , the BMC, and India's financial capital Mumbai, built assiduously over the years by the late Bal Thackeray, was threatened by a late, spectacular BJP surge, which more than doubled the party's seat tally to 82 from 31 in 2012. 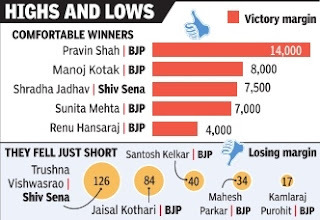 The Sena captured 84 seats of the 227, while the Congress came a poor third with just 31 seats. Both the BJP and the Sena are now trying to cobble together numbers to cross the majority mark. The BJP has already announced that it has the support of four independents. 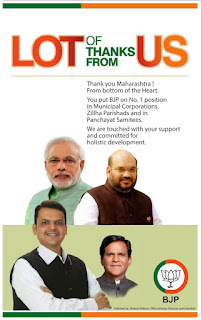 Fadnavis credited the party's performance to Prime Minister Narendra Modi's “clean image“. He said the people had voted for the “transparency agenda“ of the BJP. 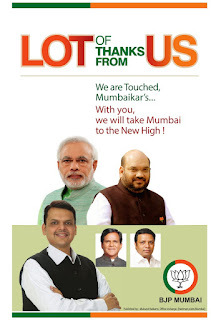 Fadnavis hinted that the BJP and Sena could come together for a post-poll arrangement. 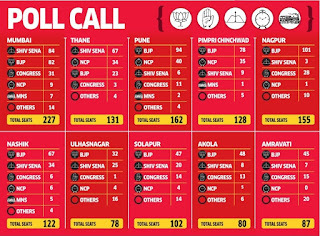 In Pune, where results for 124 of the 172 seats were declared, the BJP managed to get 77 seats and in Pimpri-Chinchwad, it emerged as the single-biggest party with 61 of the 101 seats declared (total seats: 128). 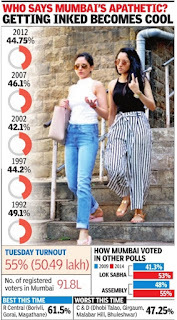 Both Pune and Pimpri-Chinchwad are considered the stronghold of the NCP and the drubbing that the party received in spite of campaigning by its leaders like Ajit Pawar will lead to tough questions within the party. 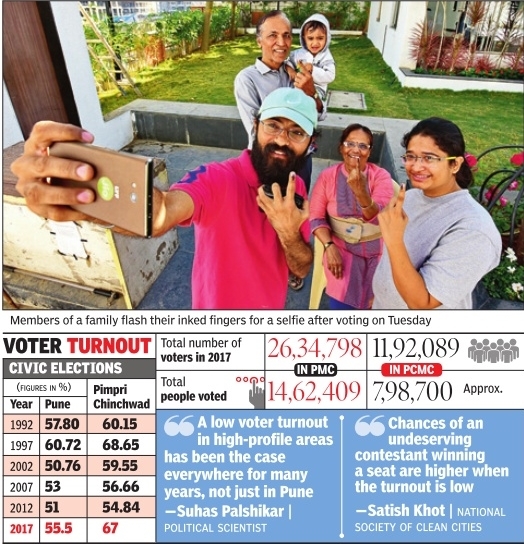 In Ulhasnagar, too, the BJP has become the single-biggest party there with 34 seats. 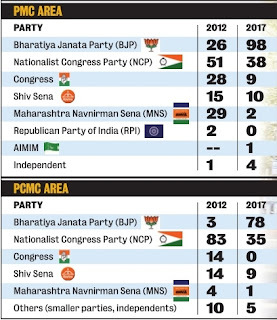 The Sena got 25 seats and the NCP, 4. 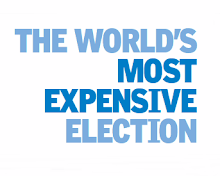 The BJP was the single-biggest party in In Akola, Amravati and Nashik also. 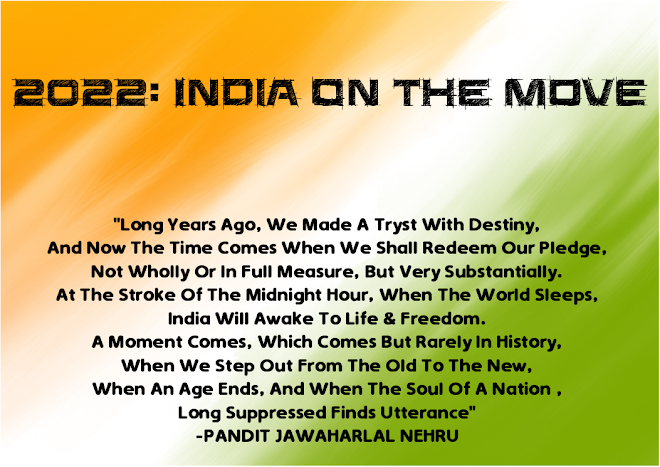 The Congress was at the helm in Amravati. The Congress lost power in Solapur, the domain of former Union Home Minister Sushil Kumar Shinde. 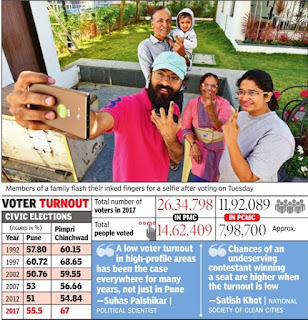 The BJP managed to emerge as the single-largest party with 39 seats. 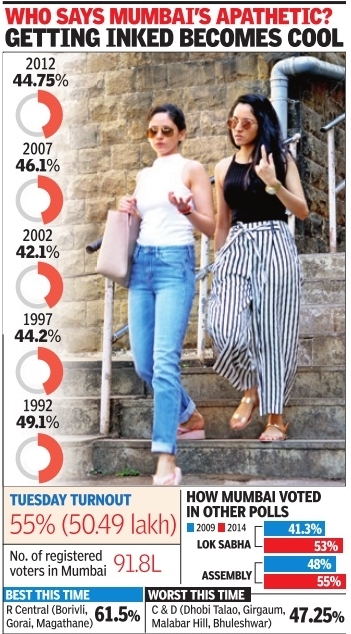 The results are significant for two reasons.One, the elections were seen as a referendum on Fadnavis's rule. 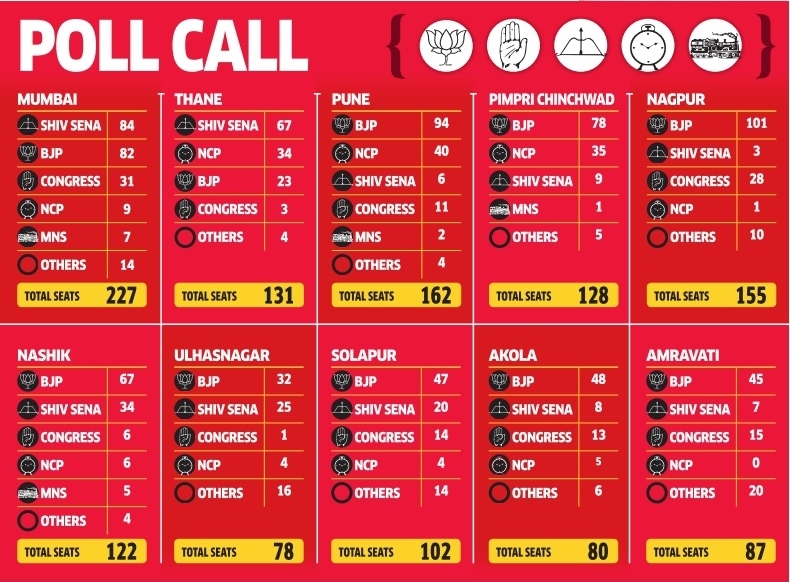 Secondly, the BJP was contesting all the polls on its own without allying with the Shiv Sena. 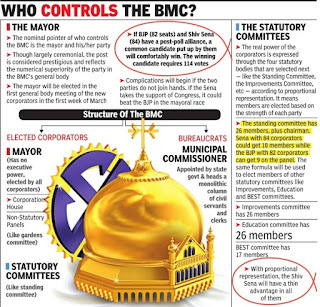 Thane is the only municipality that doesn't seem to have come under the BJP effect with the Sena coming up trumps.